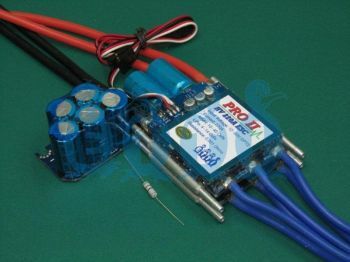 Etti High Voltage 220A Opto PRO II Navy Competition Brushless ESC for up to 60 Volts. This is a water resistant esc with water cooling for Fast Electric rc boaters. Connectors for both the motor and batteries. We suggest 8.0mm OSE or Castle Creations bullet connectors. Has no bec, so this will require an external battery eliminator circuit or a battery pack to power your receiver. NOTE: Pictures 2 and 3 show the esc with an attached capacitor board. The board is included but not installed. This is for example placement/installation purposes only.